Used instruments: standard electric guitar, 6 strings electric lap steel guitar, delays. Total time: 71 min. Audio format available: Audio CDR (single cd) / Download FLAC files. (*) MP3s here available for download are not a partial extract, but full lenght pieces. Please note these are uploaded here at time of pre-release mix. The final version available on CDR by March 2006 it’s a bit changed on some final mix adjustments. 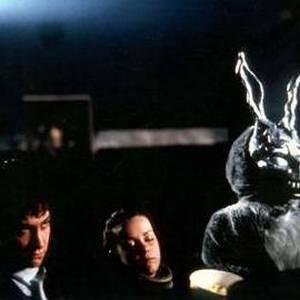 title is a sentence excerpt from film "Donnie Darko"
Cellardoor is a one-hour train trip through a new country. Each music is an endless landscape that passes fluidly outside the window. And you are there, sitting, resting your head on the glass, wondering about, well, about nothing (or everything). The silence between the musics are stations, and sometimes they are there just to wake you up, to get you back to reality. But, as soon the train starts moving again, a new view appears in your eyes. All songs are beautiful! I'm not saying that they are always pleasent, sometimes they get you to strange places. As you said, your music "reveal some new things on relistening", and it is true. I still don't know exactly what to expect when relistening it. All I know is that I'm going to have some good and maybe some not-so-good moments. I really did like the work you did on Cellardoor. thanks for the additional music! Thank you so much for that. I play it in my car all the time, so my life has taken on a beautiful dreamy quality, as if I'm living in slow motion, smiling in wonder at all that passes by ... a sweet little respite from the chronic (and perhaps self-inflicted) anxieties of life in America. Thank you, thank you, thank you! In short, Cellar Door rules! Cellardoor is an outstanding ambient work. It's very relaxing and is perfect background music when reading or during the commute to/from work. I was impressed with the music's simple qualities, and incredible depth. Those qualities and slow flow of the music make it one of my favorites in my ambient collection. I'd be very interested in hearing your guitar music combined with other instruments. I think adding more sounds or layers could yield some great results. Cellardoor is an achingly beautiful suite of ambient guitar drones that glistens with emotion and intelligence. Simultaneously engaging and meditative, Cellardoor is an astonishing and miraculous masterpiece from the highly talented and original guitarist Giorgio Robino. Being a fan of the guitar I'm well familiar with the creative potential of delay effects, having waxed ears on the early music of Pink Floyd and Fripp & Eno in my teens. In the computer age, however, the combo of guitar and delay has reached into whole new realms which ambient composers like Robert Rich have been exploring for some time now. And so we come to the enveloping music of Italian composer aka Giorgio Robino aka Solyaris. On first listen I'd swear that was drones from organ and synth with tinkling guitar overlays. But no, its all from electric guitar and a 6-string lap steel guitar treated with delay effects in a myriad of ways. I like the way you let ideas happen in time and seemingly self-generate. The sound quality (not unimportant) is very excellent. When I listen to your music, sometimes I feel calm, and other times not so calm, but it always brings me to a deep place, and I think that this is the only true compliment one can ever give to music. Not a superficial work by any means. I like your CD quite a bit and "profound" is a big compliment in English. Giorgio, nelle traccie iniziali di “Cellardoor”, evoca con la sua creatività il rumore dell’acqua limpida di cascate. Nei successivi pezzi i suoni puliti e celestiali si alternano, fino ad arrrivare all’ultima composizione, dove si percepisce come uno scoppio di cellule fuoriuscenti dal corpo umano. Giorgio, in “Cellardoor” initial tracks, evoke with his creativity the sound of waterfalls limpid water. In successive pieces clean and celestial sounds take turns, until last composition, where one perceive like an outbreak of cells coming out from human body. Amazing soundscapes! By picking up from where "Western Detunes" and "Mellow Stasis" left off, "Cellardoor" continues to explore the guitar flavored ambience of Solyaris. Giorgio Robino conjures impressive soundscapes using guitars and delays. His technique results in a beautiful and bright wall of constant guitar drone. The tracks start with tones which join into a big flow of sound which in the end dissolves at the river delta. At times it may seem a little like the dissonant rumble of a waterfall but you get comfortable with it it's actually quite a harmonic, soft and warm journey like a gentle flow of water which seems to have inspired Robino. La musica ci chiede di essere ascoltata. Ognuno di noi può usare la musica per scopi diversi. Può essere una compagnia, un momento di studio, evocare ricordi e sensazioni, essere quella preferita. L'esperienza dell'ascolto della musica di Solyaris è stato un regalo. Sarà questa musica primordiale e visionaria ad agire su di noi. Music asks to us to be listened. Everyone could use music for different aims. It could be a company, a moment of study, it could evoke memories and feelings, and it could be” the preferred one”. Solyaris music listening experience is a gift; this primordial and visionary music will act to us. Just finished listening through Cellardoor, and I have to agree with the high praise this music has earned. Giorgio coaxes many beautiful sounds from his guitar and weaves them together into a drifting opus that feels like ice sliding over ice. When I first received the CD, I found it difficult to reach the right frame of mind to give the work my best attention. It was not a fault of the CD, really, because the work is a solid one in both its production values and in its melodic and harmonic setting. Rather, I personally found it hard to concentrate on the shimmering washes of processed guitar sound and interplay of various chromatic melody settings which characterize Giorgio's work. I would play the first track or two, but then realize I was not in that subtle, quiet space in which a Solyaris work is best enjoyed. Last night I reached that listener's space--less a "mystic place" than a quiet moment during a flight west for business. I fired up the CD player, put in "Cellar Door", and found it a consistent delight. Phrases like "light ambient" are by their nature tossaway, because the genre has evolved so much that they no longer really convey very much about the work. Yet I think it's useful to say that Solyaris' work is not a dark or difficult sound, but instead features wave upon wave of light melodic interplay, a kind of "shimmering ambient". Those who like their ambient to feature rich, lush, melodic drones, but who disdain hackneyed, new-age phrasings and melodies, will find much of interest in "Cellar Door". I don't think that the CD rewards those who resist the patient and open-minded calm that Solyaris' work achieves. It's an incremental work, building slowly its experiments in processed melody and surprisingly pleasing atonalities. But it's a good listen for those who like their ambient majestic and yet not maudlin. I'm glad I gave "Cellar Door" the careful attention it deserves, and recommend it on its own terms, for what it achieves. With a break from composing and recording comes more time to listen. Among the more fascinating packages to come my way of late is one from Italy containing CD-Rs by composer-recordist Giorgio Robino, who releases his work under the name Solyaris (a tribute to great visionary film maker Andrei Tarkovsky). I've been listening for a few days now to MELLOW STASIS (REDUCED EDITION) and CELLARDOOR. On these recordings, Robino uses the ringing, crystalline tones of lap steel and standard guitars as the starting point for long, emotionally evocative electronically-processed compositions (in particular, Robino utilizes long echos, delays, and looping) that manifest a highly-developed sense of tonality and resonant spaciousness. The music of Solyaris is engaging and engulfing, with a slow-motion drift; its subtle underlying structure might suggest the majesty of massive wind-swept sands or the infinite shimmer of stars at night. On the surface of these works one might at first detect an undeniable sonic debt to ambient pioneers like Robert Rich and Steve Roach. But to my ears, Robino's work sounds wilder; more free and open to surprise than that of his musical forebears. I've really enjoyed falling into these adventurous and panoramic fields of sound. Cellar Door is a wonderful CD. The steel balances as well as accentuates the dynamics within each track. The steel was more prevalent on this CD as you used the harmonics to grab emotions - fear, anticipation, apprehension, and excitement only then to sooth the listener with the soft mood tones. It is an aerobic workout for the ears. Great job! Wow, this is very beautiful music! We will definitely play this on Drone Zone. Hai fatto un buon lavoro, “Cellardoor” si ascolta con piacere, liquido, cullante una specie di massaggio multidimensionale che mai stanca e induce stati rilassati e svegli,oppure assopiti ma presenti al suono che fluisce compare e scompare, resta nell'aria dopo averla scolpita. You have done a good work, “Cellardoor” is listened with pleasure, liquid, cradling, a sort of multidimensional massage that never tire indeed inducing relaxed moods and awakes or drowsed but present to the flowing sound that appear and disappear, remaining in the air after having sculpted it. Solyaris (Giorgio Robino) has another winner on his hands with his upcoming release “Cellardoor”. I've recently been doing the "Secret Music" show with Scott Raymond, and we got a couple of inquiring phone calls after we played a track (even after I gave out the Web site where it can eventually be purchased). I'm not sure how far he is from his final mix, but Giorgio's work, like any fine artist continues to evolve. I thought “Western Detunes” was perfect music to wake up to-bright, cheery, with a lot of single note runs and looping. “Mellow Stasis”, as I said elsewhere, was neither "mellow" or "static,": harmonically, it may have even been stronger then the first release because of some of the beautiful chord clusters, and I found (especially) the longer pieces to be beautifully intense. On “Cellardoor”, Giorgio's love for the drone-influenced works of Stars Of The Lid and Windy & Carl are more evident, but that is not what this work is about. Cellardoor is, in fact, a "concept album," but since I haven’t yet seen the "source" of Cellardoor , maybe Giorgio should explain the main influence behind the CD, where the track names come from, and what the CD is based upon. It's very interesting stuff, but obviously the music stands on ts own quite well also.. I am listening to "Every Living Creature on Earth" as I type this. “Cellardoor” is going to be another great release! You say your works are mostly inspired by the sea, but I don't get that myself. I picture a much more open place. In particular, the sky. I can see listening to this as I floated along the air currents in a sailplane or hot air balloon. A feeling of being detached from the Earth. I guess it all is in the imagination of the listener, but I detect a more "airy" feeling than the more muffled sounds of being underwater. But, that's just me. I am definitely enjoying it!